This quote really hit me hard because of the truth in it. I mean, Superman has struggled for the last twenty years give or take to maintain relevance among the darker heroes, anti-heroes and the like with his Boy Scout image. 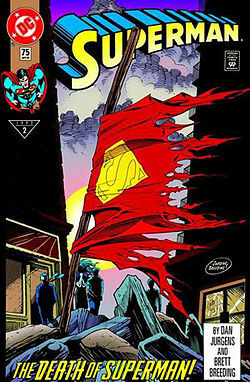 And Batman is right, during that vying to maintain relevance, the only time he really shot back into the mainstream was with his death in The Death of Superman, which is a great and quintessential Superman story to read. Superman has been around for seventy-five years and I guess I still find it peculiar the criticisms directed at him: that he’s behind the times, out of touch, too good, too powerful, too boring, etc. How can someone be too good? What’s wrong with inspiring people and giving them hope? These are all laudable and necessary things that humans ought to strive for. I think what has happened in media is we as an audience want to see more internal struggle. This is why Superman Vs The Elite is one of the best animated superman movies ever. They take it from “how hard does superman need to punch this guy to stop him” to “is what superman does the right thing and how can he overcome the antagonist of public opinion.”I used to not care for superman, I’m a huge batman fan, but as they’ve worked on bringing at least his personality down to earth making batman one of his closest friends (godfather to his son), I’m starting to like him a bit more. Well said, sir. Agreed on Superman vs. The Elite, probably my favorite offering from DC Animated films. And really, that’s what I’ve always loved about Superman is that sense of internal struggle with respect to his identity, his heritage, his future (destiny) and all of that. Thanks for the feedback!